OWEN SOUND, ON--(Marketwired - July 14, 2016) - Reid's Heritage Homes has just released a new collection of detached bungalows and townhome bungalows at their Cobble Beach community near Owen Sound. The picture perfect community is built on 574 acres of pristine land on the panoramic shores of Georgian Bay. Set amidst acres of property that overlooks the majestic waterscape, the bungalows have been designed to maximize water and golf views. Roof lines, site-positioning and strategically placed windows encourage residents to enjoy the great outdoors from the comfort of their home. The community is ideally located just a scenic 10 minute drive from the bustling downtown of Owen Sound, and a convenient two hours from Toronto Pearson International Airport. As a master-planned community, Cobble Beach features a balance between resort and residential elements. The Nantucket-style Clubhouse acts as the social, recreational and gastronomic heart of the community, providing a place to socialize with fellow residents or entertain family and friends. The Inn and Sweetwater Restaurant and Bar at Cobble Beach Resort and Spa both recently received TripAdvisor 2016 Certificates of Excellence -- accolades that reflect consistently great reviews earned. Homeowners will enjoy full access to The Spa's sauna, whirlpool and tennis courts, as well as the fitness centre and plunge pool. Cobble Beach is a vibrant, four seasons community for active individuals and families seeking a recreational property or full-time residence. Residents have a multitude of activities to choose from, including golfing, 14 kilometres of hiking trails, mountain biking, swimming, kayaking, sailing, fishing and relaxing on the beach in the warmer seasons. A 260 foot day dock with resident boat moorage is a popular attraction in the community. Golf lovers will take immense pleasure in the 18 hole link style golf course located quite literally in their own backyards. Once the cold weather arrives, there is no need to take permanent refuge indoors, with the opportunity for cross-country skiing, snowshoeing, dog sledding, ice skating, ice fishing and snowmobiling. Downhill skiing can also be enjoyed only 45 minutes away. 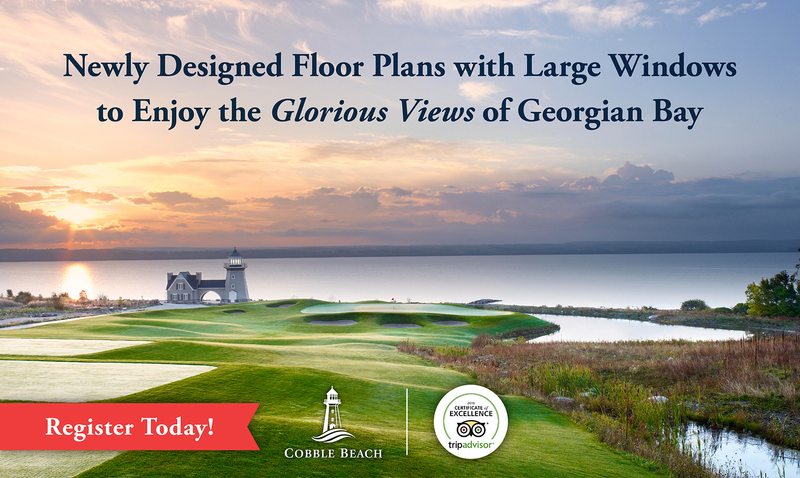 The Residences of Cobble Beach offers homes with glorious views of Georgian Bay; a plethora of indoor and outdoor activities; 5 star dining and endless social activities. For the lifestyle seeker who wants it all, this community does not disappoint. Broker, Century 21 Millennium Inc.
Reid's Heritage Homes has just released new detached and townhome bungalow designs at The Residences of Cobble Beach near ‪Owen Sound‬. The new designs range from 1,700 - 2,700 sq. ft., with 1 - 5 Bed and 1.5 - 3 Bath.